Please feel free to come and check out new and improved facility! We sport a newly painted, spacious 11,500 square foot facility that is fully air-conditioned. 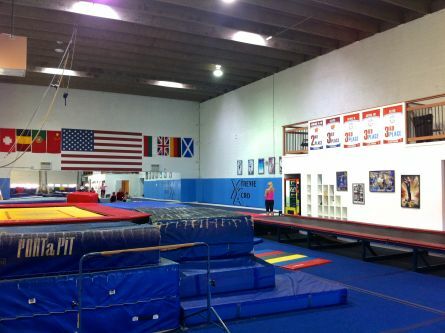 There are two full 42x42 acrobatic gymnastics spring floor, a competitive tumbling track, a competitive Aussie bed trampoline, a tumble tramp, rope, 3 training belts (one above the trampoline and two above the acrobatics floor - including a twisting belt) and tons of pre-school equipment! There is a lobby seating area for those waiting to pick up their athletes, as well as a newly renovated spacious second-story parent viewing area with free wireless internet connection, in addition to granite-topped office and bathrooms. The athletes have a separate team room for privacy (when changing) and storage for their belongings. We also have a new pro shop where customers can purchase leotards, Xtreme apparel, snacks, drinks and more!